Hydro Excavation is a non-mechanical and non-destructive process which combines pressurized water and a very powerful vacuum to simultaneously excavate soils at a controlled rate. The soil and water slurry are conveyed via an 8” tube to a truck mounted debris tank. This process allows for quick, clean and precise excavations which require less backfill, less labor force, less restoration and less environmental impact than conventional digging methods. A controlled flow water stream allows for surgeon-like accuracy. While removing only material necessary for repair or inspection, minimal material needs to be removed when compared with the large, less-than-accurate excavator or back-hoe bucket. The use of hydrovacs for potholing purposes is expanding. The potholing process is a means of exploratory digging for known and unknown utility lines exact location. Potholing through mechanical means is very risky process that uses more hope and luck than good practices. Hydro excavation is the preferred method of opening utility pole holes. Utility poles are installed on utility easements that often carry other buried utilities. Our very powerful vacuum can be used to remove nearly anything that will go through our 8” vacuum hose. Hard to reach locations are no problem for the remote hose that can be coupled together for up to 600’ reach. Car wash pits, drill mud, retaining ponds and pits and underground detention basins are all regularly vacuumed out by our powerful hydrovacs. Powerful and controlled water pressure combined with our powerful vacuum can be a cost effective method of cleaning out hard to reach culverts, storm drains and sewers..
Slot Trenching can be done very precisely through our hand held wands. Any length, width and depth can be cut exactly where needed with the use of Precision Daylighting’s hydrovacs. PDI now offers air excavation in addition to our hydro services. We still use our powerful hydrovacs but add the capabilities of using pressurized air through a hand held wand instead of water. The advantages are that you now have dry material to dispose of instead of wet. 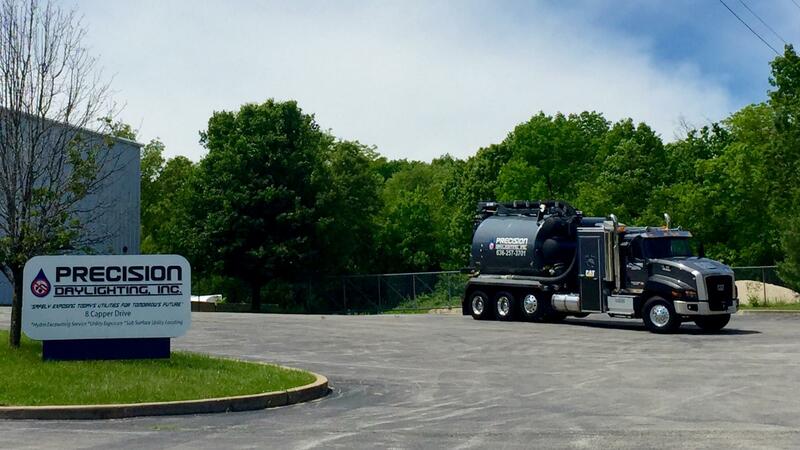 This material is often then used as backfill for the excavation..
Each Precision Daylighting hydrovac truck is a cold weather truck equipped with on-board boilers which allows us to cut right through frozen soil. While other mechanical means are powerless against frozen soil, excavation by hydrovac trucks will hardly be slowed down. Hard to reach areas are a Precision Daylighting specialty. Heavy equipment can destroy the aesthetics of a property. Hydro excavation through a hand held water line and vacuum can preserve many properties original landscaping with minimal disruptions. We have completed nearly impossible excavations by extending the vacuum hose and water hoses to reach inside of buildings while the hydrovac sits curbside. PDI has excavated inside of elevator shafts, schools, hospitals, mines, stadiums and community buildings. If we can get our hoses to it, we can dig it.